Asus produces a wide array of machines, but until recently has only concentrated on the higher end of the market. 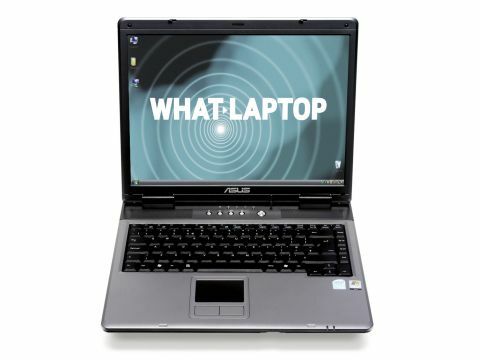 The Asus A9RP (£374 inc. VAT) is a model designed for the entry-level sector. The design has been around for some time and it is starting to look its age. This can be seen in the use of a 4:3 aspect ratio screen, instead of the more multimedia-friendly widescreens. As it also lacks a Super-TFT coating, images don't appear as vibrant as on newer screens. That said, we found this screen didn't dim too much when running on battery power. The build quality of the A9RP is extremely high, though, as the plastic used for the case is thick and solid to the touch. The same plastic is used to protect the back of the 15-inch screen, which produces very little flex to the panel. Overall, it's impressively strong. Asus has opted to use an ATi chipset that comes with an integrated GPU (Graphics Processing Unit) - in this instance the Radeon Xpress 200M. This is an older chip and this is reflected in the lower benchmarks. You'll find the use of an Intel Celeron M processor inside. In this instance, it is the 1.86GHz variant, which is a reasonably good performer. Coupled with 512MB of memory, it is sufficient for everyday tasks. However, with Windows Vista Basic installed, we did find the laptop took a long time to boot, so a memory upgrade would make a sensible purchase. Easily the weakest part of the A9RP is its keyboard. The keys are not only small, but they're also the least secure, creating a rattling sound as we typed. That said, you'll quickly grow accustomed to the keys and, as they're responsive, they certainly match the price of the machine. The touchpad and mouse keys are also small, but proved to be reliable. Weighing in at 3.1kg, this isn't the most portable of machines and with a battery life, under test, of under three hours, it isn't ideal for the mobile traveller. We feel this machine would better suit those requiring a basic desktop replacement rather than a portable device. The Asus A9RP offers genuine value for money, with a good build quality and reasonable performance. That said, it's a dated design and is starting to show signs of being superseded by newer models.